The Seattle City Council is the legislative body of the city of Seattle, Washington. The Council consists of nine members serving four-year terms, seven of which are elected by electoral districts and two of which are elected in citywide at-large positions; all elections are non-partisan. It has the sole responsibility of approving the city's budget, and develops laws and policies intended to promote the health and safety of Seattle's residents. The Council passes all legislation related to the city's police, firefighting, parks, libraries, and electricity, water supply, solid waste, and drainage utilities. Election of city council members occur on odd-numbered years, with at-large seats staggered from district seats. City council members' terms begin January 1 although public ceremonies are held on the following Monday. The council positions are officially non-partisan and the ballot gives no party designations. Party identification is based on candidates' voluntary self-identification. Like other elections in Washington, all candidates run together in the primary with the top two progressing to the general election. Candidates may participate in Seattle's unique Democracy voucher program, which provides residents with vouchers to give candidates for public campaign funding. Results of the 2015 City Council election. Size of circle shows total votes cast in each District or Position. Names and percentages given for top two candidates, and incumbent, in each race. Beginning in 2015, the geographic outline of the 7 districts and 2 citywide positions are as follows. Some neighborhoods overlap more than one district, indicated with an asterisk*. Redistricting will occur every 10 years starting in fall 2022. Seattle was first incorporated as a town by an act of the Territorial Legislature on January 14, 1865. The town charter established a five-member board of trustees to govern Seattle, which appointed citizens to other positions. The act was repealed January 18, 1867, after most of the town's leading citizens petitioned for its dissolution. Seattle was again incorporated, this time as a City, on December 2, 1869. The new unicameral legislature, known as the Common Council, was elected at-large to one year terms. At-large election was replaced in 1884 by a system of 14 wards and four members elected at-large, all elected to two-year terms. The Home Rule Charter, adopted in 1890, reorganized the city council into a bicameral legislature, with a nine-member Board of Alderman and a sixteen-member House of Delegates. 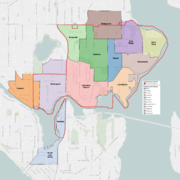 In 2013, Seattle voters approved Charter Amendment 19 calling for the nine citywide Seattle City Council positions to be divided into seven district-elected seats and two citywide, at-large seats. The transition to districts started with 2013's elections for Positions 2, 4, 6, and 8 being truncated, two-year terms. 2015's election cycle featured all nine seats, except the seven district positions were elected to full, four-year terms and the two at-large positions would be for truncated, two-year terms. The first primary based on this system was held August 4, 2015 and the first city council election based on districts was held on November 3, 2015. 1869–1883 – Seven at-large Council members elected for one-year terms. 1884 – Nine Council members elected: three from each of the three wards, elected to two-year terms. 1886 – One ward added, Council reduced to eight members: two elected from each ward for two-years terms. 1890 – The Home Rule Charter established eight wards and bicameral legislature. A Board of Delegates composed of nine at-large members was elected for four-year terms. House of Delegates had 16 members – Two from each ward, elected for two-year terms. 1892 – One ward added to make nine. Both houses to have nine members – all elected from wards. 1896 – New Home Rule Charter reestablished unicameral legislature with nine wards. One Council member elected from each ward for two years and four elected at large for four-year terms. 1905 – Two wards added to make 11. One Council member from each with four at-large – 15 council members total. 1907 – The Charter was amended twice during the year, the first time adding two more wards, increasing the size of Council to 17. Later, another ward was added (to make 14), increasing Council to 18 members. 1910 – The Charter was amended to abolish wards, reduce Council to nine at-large positions elected to three-year terms. This took effect in 1911 and remained constant until 1946. The 1910 Charter amendments also made the elections non-partisan. Prior to that candidates for Council (and other City offices) ran on party tickets. 1946 – The new Charter created the four-year term. 2013 – City voters pass measure changing councilmember elections to a mostly-district-based system. 2015 – First councilmember elections to be held under new district-based system. As of September 28, 2010, Councilmembers Sally Bagshaw, Richard Conlin, Nick Licata and Mike O'Brien earn $117,533.52 annually. Councilmembers who were re-elected in 2011, Tim Burgess, Sally J. Clark, Jean Godden, Bruce Harrell, and Tom Rasmussen, will earn an annual salary of $119,976.48, effective January 1, 2012. Their salary will remain at this level through December 31, 2015. As of April 2018, salaries of Councilmembers are authorized to be $62.11 per hour, an increase of 5% from 2017. This is equivalent to an annualized pay of $129,685.68. Among the nation's 40 largest cities, only Los Angeles pays its council more — $149,000, according to a survey by The Seattle Times. Seattle ranks 23rd in population, according to the Census Bureau. Establishing of committees and appointment of committee chairs and members. Presiding over meetings of the full council. Assuming the duties and responsibilities of Mayor if the Mayor is absent or incapacitated. Hiram Gill, council member 1898–1902, 1904–1910, then mayor. Famous as an "Open Town" advocate, he later allied with "Closed Town" reformers. ^ "Seattle City Council Members / 1946-2015". Seattle Municipal Archives. Retrieved March 29, 2019. The 1963 State Elections Act (RCW 29.13) mandated ... Terms of office were to begin on the first day of the next year. ^ "RCW 29A.52.231 Nonpartisan offices specified". Revised Code of Washington. Retrieved March 29, 2019. All city, town, and special purpose district elective offices shall be nonpartisan and the candidates therefor shall be nominated and elected as such. ^ "Districts FAQ". Find Your Council District. Office of the City Clerk. Retrieved February 27, 2019. ^ Lange, Greg; Tate, Cassandra (November 4, 1998). "Legislature incorporates the Town of Seattle for the first time on January 14, 1865". HistoryLink. Retrieved December 5, 2017. ^ "1869-1882: The Common Council under the First City Charter". Seattle Municipal Archives. Retrieved December 5, 2017. ^ "1884-1890: Ward System Established". Seattle Municipal Archives. Retrieved December 5, 2017. ^ Charter of The City of Seattle, Commonly Known as The Freeholders' Charter. Seattle: The Northwestern Printing Company. October 1, 1890. p. 9. OCLC 38579564. Retrieved December 5, 2017 – via Google Books. ^ a b "Charter Amendment 19" (PDF). King County Elections. August 5, 2013. p. 7. Retrieved February 27, 2019. ^ Seattle City Council Members, 1869–Present Chronological Listing, Seattle City Archives. Accessed online February 1, 2011. ^ "General and Special Elections - CityArchives | seattle.gov". www.seattle.gov. Retrieved 2019-02-14. "Seattle City Council Members, 1869–Present Chronological Listing". Seattle City Archives. Retrieved 2019-01-16. Hugh DeLacy Papers. 1938–1985. 4.87 cubic feet (11 boxes, 1 map tube, 1 package). Contains records from DeLacy's service with the Seattle City Council from 1938–1939. Frederick G. Hamley Papers. 1933–1963. 6.83 cubic feet. Contains records from Hamley's service with the Seattle City Council from 1935–1936. Austin E. Griffiths Papers. 1891–1952. 11.73 cubic feet (25 boxes). Contains records from Griffiths' career as Settle city councilman from 1910–1913.